HANNOVER MESSE is a unique opportunity to stimulate growth and identify new customers in previously untapped markets. The 6,500 exhibitors expected at HANNOVER MESSE in 2017 can count on reaching an expert audience of decision-makers who are willing to invest. With more than five million leads per trade show, HANNOVER MESSE is the perfect place for unveiling new products and technological developments, as well as for generating new business leads. Industrial Supply is the global sourcing platform for innovative subcontracting solutions and lightweight construction. Experts from a complete range of user industries come here to gather information One of the key benefits of HANNOVER MESSE is the sheer range of solutions on show – a fact that’s not lost on anyone who has ever visited its industrial supply displays. Whether they are looking for lightweight technologies or smart materials, buyers go to the Industrial Supply show at HANNOVER MESSE because it enables them to survey all the best solutions available, all at one convenient time and place. This year, Hannover Messe will be held from April 24 to 28, 2017 Hannover Exhibition Grounds, Messegelände, D-30521 Hannoverat, Hannover, Germany. 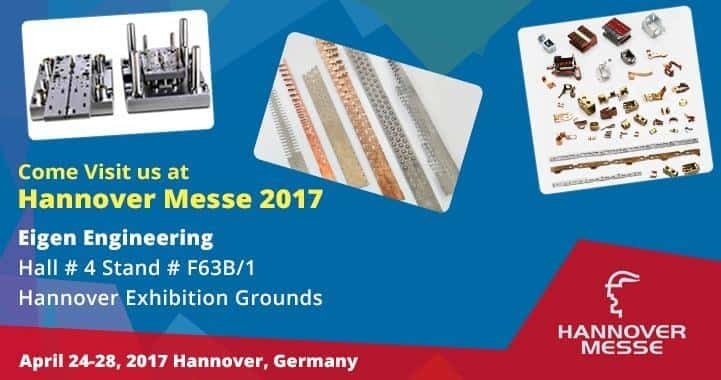 Plan to stop by Hall # 4 Stand # F63B/1 to find out more about Progressive Tooling and Precision Metal Stamping for your company.